If, you are an Outlook user and you want to convert MS Outlook files in any other format then, you can use MS Outlook Conversion software. 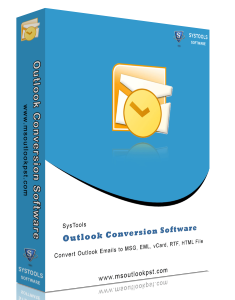 With this single MS Outlook Conversion tool, you can convert MS Outlook Files into multiple formats i.e. you can convert MS Outlook files into EML, MSG, HTML, MHT, TXT, VCF and RTF formats. All these formats have their own uses and you can convert PST files of Outlook in these formats by this tool. Outlook is a personal information manager by Microsoft and it used by many people around the world for exchange of emails, management of contacts, updating of calendar entries etc. The database file formed in this application is called PST file, which stores the entire information of Outlook application including emails, calendar, contacts, tasks and journals. This database file PST of Outlook can be converted easily to other formats with MS Outlook Conversion software. If you chose to convert MS Outlook files into MSG file format then, you get individual files of all your Outlook emails because MSG is the single mail file format in MS Outlook. If you choose to convert PST files into RTF then, you can easily open your Outlook emails in MS Word because RTF is Rich Text Format and it is supported by Word application. If you choose to convert Outlook files into TXT format then, you get the ability to open your emails in Notepad as TXT is the format of Notepad files. If you choose to convert your Outlook emails in HTML and MHT formats then, you get your emails in webpage format and plain text formats. If you choose to convert your PST file into EML format then, you can access your emails in Outlook Express, Windows Mail and Windows Live Mail because EML is the single mail file format of Outlook Express, which is also supported by Windows Mail and Windows Live Mail.